If you like Greek yogurt and rich, flavorful, creamy goodness, you’ll love this smoothie. This recipe is not a result of one of my successful kitchen experiments. Fellow Greek yogurt enthusiast, Elizabeth, gifted this recipe to me. With ample healthy fat and adequate protein. This smoothie is nice and filling. It’s also quite healthy thanks to the star ingredients. Greek yogurt is a great option for getting more protein into your diet without using a protein powder supplement. It’s rich in beneficial bacteria or probiotics. These friendly flora are essential to proper digestion, assimilation of nutrients, and immune system functioning. Greek yogurt also provides a good amount of calcium – in a form that’s more easily absorbed due to the beneficial bacteria or live cultures. Strawberries are loaded with antioxidants (high in vitamin C) and their nutrient profile leads to the following health benefits: boost your immunity, good for you eyes, anti-inflammatory, blood pressure regulator, and good for your skin. For everything you could ever want to know about Greek yogurt or to view the original recipe, click here. Most people won’t need a sweetener. The fruit provides enough. Enjoy! 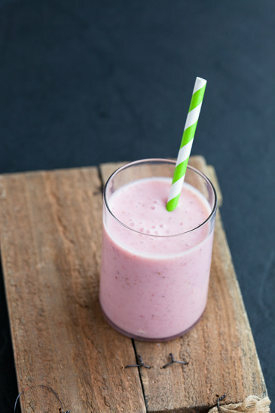 What do you think of this Greek yogurt strawberry smoothie, did you try it? Please leave a comment below. Happy Blending! Some of these recipes contain a significant amount of fat and sugar. I’m not sure how they are healthy. Please explain. Absolute newbie to smoothies, class 2 diabetic looking to improve by diet (smoothies) and exercise. Some of my smoothies are high in sugar from natural sources such as fruit, honey, and maple syrup. Refined white table sugar, like unhealthy fats, should be avoided as well. I was looking for something to make with the greek yogurt that nobody wanted. I made this smoothie this morning and it was great, my husband loved it and asked me to keep making it. I follow the exact recipe and added some unsweetened coconut shreds.Thanks for sharing it! I just made this recipe and used chocolate soymilk and it was delicious! Thank you!